In Revelation 4, John is given a glimpse into heaven and what he sees is astounding: God, seated on His throne, receiving the worship of the heavenly host. The scene shifts in the next chapter; God holds a scroll, representing His will for creation, and the question rings out: Who is worthy to break the seals of this scroll? And John weeps, for no one is found worthy. Scholars say the word for weep here is reserved for the most dramatic form of mourning. John wails, for the universe is without a hero. But one of the elders says to him, “Don’t weep! Behold, the Lion of Judah!” In ancient literature, the lion functioned as an image of great strength and courage. As the rulers of the animal kingdom, many ancient kings were fond of comparing themselves to lions. The same expression can be found in the OT. In Gen. 49, Jacob confers a blessing upon his sons and he refers to Judah as a lion, wielding a scepter and vanquishing his enemies. A Messianic expectation developed in reference to this passage: the Lion of Judah would someday emerge, a mighty warrior prince who would reign victorious over a restored Israel. In his vision, John turns to see this one who has been called the Lion of Judah. If this were a movie, this is the point where you’d expect the music to rise and the hero to appear. Think John Wayne riding up on his horse or Jack Bauer kicking down the door or Tony Stark donning the Iron Man suit. This is where we expect some action. This is when the bad guys are finally gonna get what’s coming to them. But John turns to see the Lion of Judah…and instead, he sees a Lamb. If the Lion of Judah is an image of victory, then the Lamb is an image of helplessness. Lambs are some of the most vulnerable little animals. The lamb has always been the symbol of innocence, meekness, lowliness, and gentleness. But this isn’t just any lamb; John says he sees “a Lamb looking as if it had been slain.” The lamb was the animal of sacrifice in Judaism.Many of the Jewish sacrifices required the lamb as an offering. John sees a Lamb that bears the marks of slaughter, a Lamb that has been sacrificed. And we think to ourselves, This is the victorious image that John sees in Revelation? We might be tempted to tell John that he mixed up his stories. John, this isn’t a victory story. This sounds like a story of failure! A slaughtered Lamb? Where’s the Lion of Judah? Where’s the real hero? We want our John Wayne. We want Jack Bauer. We want Iron Man. We’re ready for the hero to come in guns blazing to kick evil in the teeth! No, John, you must’ve gotten this one wrong! But this is the central paradox of Revelation and the Christian faith in general: Jesus conquered not by force but by death; not by violence, but by martyrdom. Jesus overcomes by dying, which challenges our concept of victory. Sure, the Lamb bears the mark of slaughter on His body, but there is one inescapable feature here that makes all the difference: the Lamb is still alive. The victorious Lion is actually the risen Lamb! 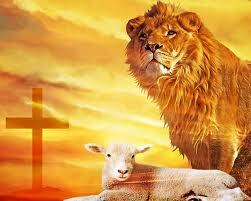 He became the Lion of Judah by being the Lamb of God. And in so doing, He became the rightful king of the world. This entry was posted in Devotional, Faith, Jesus, Scripture, Theology and tagged Easter Sunday 2014, Genesis 49, Lamb of God, Lion of Judah, Revelation 5. Bookmark the permalink.